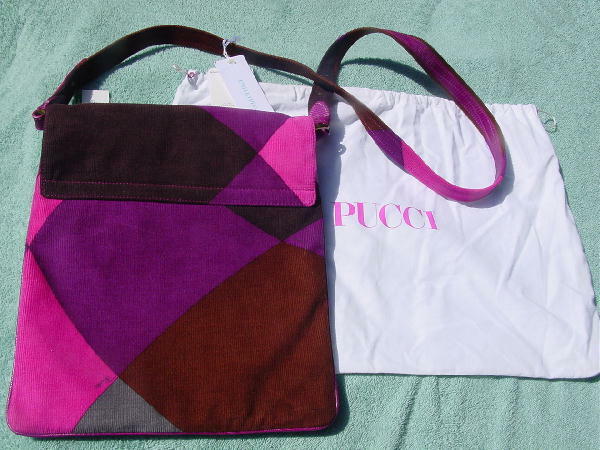 This never-used 100% cotton (corduroy) and leather messenger style purse was made in Italy by Emilio Pucci. 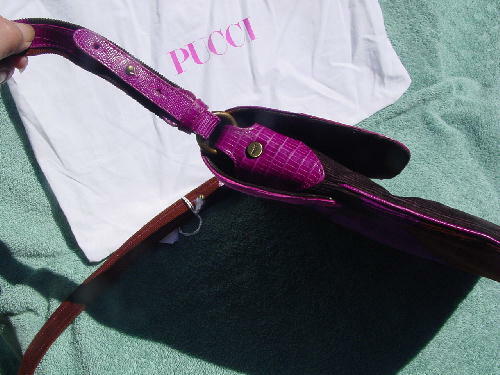 The calf leather embossed snakeskin lower front flap has Pucci etched on its front. The top center of the shoulder strap side adjustors and strap holders are also in the magenta-light wine embossed snakeskin leather. The strap lower rings are in a brass-tone metal and the tacks have Pucci etched on them. 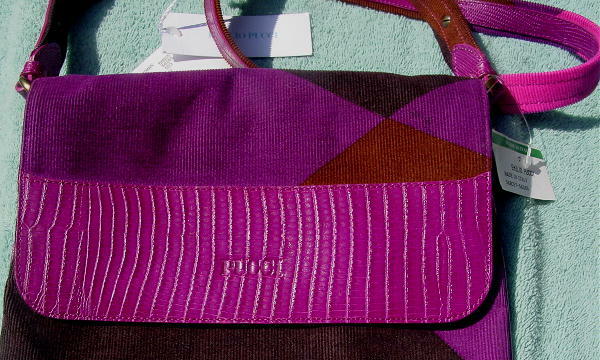 The shoulder strap is corduroy underneath and edging the embossed leather on the top. 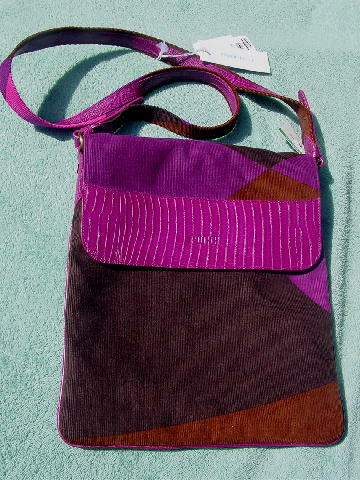 It has a geometric pattern in dark brown, golden medium brown, magenta-light wine, hot rosy pink, and dark gray. 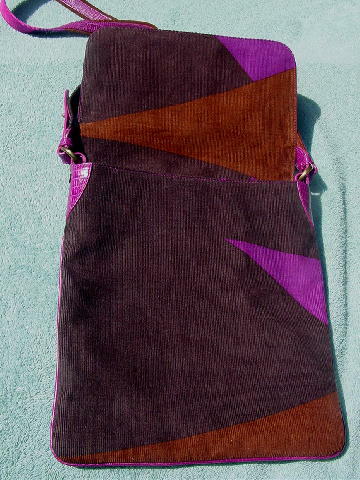 The interior 100% polyester lining is in a black tone-on-tone swirl pattern. 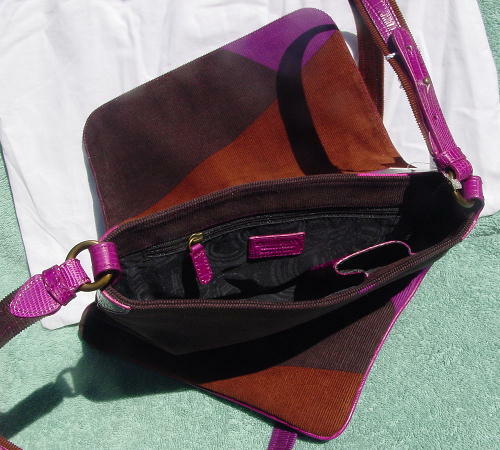 There is an interior large zippered lined pocket with a leather pull. On the front of the pocket is an embossed leather tag with an etched Emilio Pucci Genuine Leather Made In Italy. On the interior front side is a small open pocket in the embossed leather. The manufacturer's tags are still attached, and it has its own white bag. Emilio is in black letters on the flap and lower back.